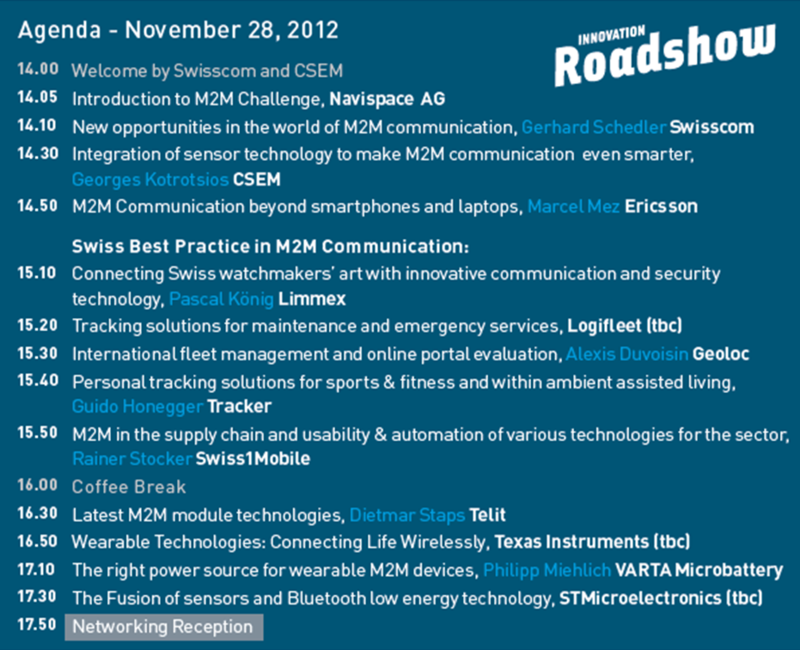 In cooperation with the Swiss research institute CSEM (Swiss Center for Electronics and Microtechnology) the Innovation Roadshow is coming to Bern, Switzerland, on November 28th. With leading industry and research representatives from companies such as Swisscom or Ericsson and CSEM, the Innovation Roadshow is the perfect place to learn more about future solutions and business models in the fields of Machine-to-Machine communication and Wearable Technologies. Furthermore, there will be a best practice panel with Swiss companies such as Limmex or Tracker.ch that are perfect examples of how Swiss innovations can successfully be implemented, both within Switzerland and beyond Swiss borders. Participation in the Innovation Roadshow in Bern is free of charge. Register now and benefit from this excellent networking opportunity with high level industry experts.